Branchial cleft cysts are typically benign congenital cysts lined by epithelial cells that arise on the lateral part of the neck. Ultrasound is useful in situations, where CT scanning and MRI are unavailable. We report a case of a 29-year-old Ugandan male who presents with a unilateral neck mass. We highlight the usefulness of ultrasound in diagnosing a lesion consistent with a branchial cleft cyst, while ruling out other causes of neck masses. Branchial cleft cysts are one of the most common congenital cause of a neck mass, however, the exact worldwide incidence is unknown . The differential diagnosis for neck masses is broad and in an austere environment imaging modalities are scare. We report a case of a putative branchial cleft cyst diagnosed by bedside ultrasonography. 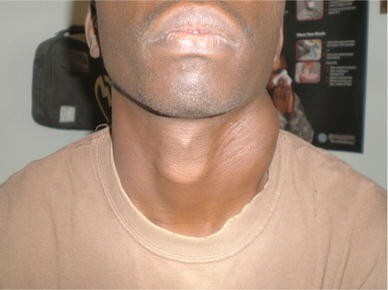 A 29-year-old Ugandan man presented to the emergency department (ED) with a left-sided neck mass, he had his entire life. The patient denied pain, fever, drainage from the mass, respiratory difficulty, or change in size of the mass. Physical examination was notable for a 6.0 × 3.8 cm, firm, non-tender, non-mobile mass on the lateral aspect of the left neck (Fig. 1). He had no lymphadenopathy. 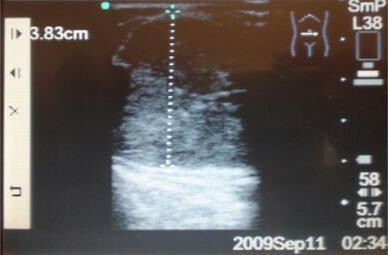 Ultrasonography was performed bedside which revealed a well-defined, low-density mass with a uniformly thin-enhancing rim (Fig. 2) which lacked flow on color Doppler (Fig. 3). The mass was located 1.5 cm lateral to the internal carotid artery (Fig. 4). On further questioning, the patient related that he had a fine-needle aspiration performed as a child which confirmed our findings. The term branchia is a Greek word meaning gill and is defined usually in the context of respiratory organs of water-living animals . A branchial cleft cyst usually arises during embryogenesis if a portion of the cleft fails to involute completely. This entrapped remnant becomes an epithelium-lined cyst located in the lateral aspect of the neck [4, 6]. The differential diagnosis for neck masses is broad and includes branchial cleft cyst, thyroglossal duct cyst, dermoid cyst, hemangioma, neurogenic tumor, lymphoma, lipoma, and most commonly inflammatory neck masses . Branchial anomalies account for approximately 30% of all congenital neck masses and usually present as cysts, sinuses or fistulae . Although congenital, they may not present clinically until early adulthood. They are rarely bilateral and may cluster in families . Ultrasound, computed tomography, or MRI will delineate the cystic nature of the mass . Branchial cysts are smooth, round, and non-tender. They are located generally at the anteromedial border of the sternocleidomastoid muscle between the muscle and overlying skin, not associated with cervical vascular structures and may become inflamed, infected, and have associated purulent discharge if a sinus tract is present . Dermoids are located adjacent or within a thyroid lobe and neurogenic tumors are paraspinal . A fine-needle aspiration may be necessary to distinguish a branchial cleft cyst from malignancy or to guide antibiotic therapy for infected cysts . 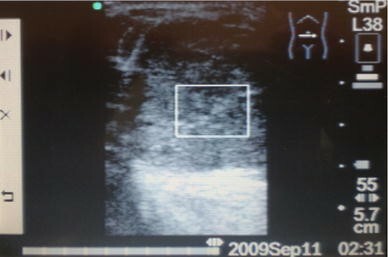 Typical ultrasound characteristics include a well-defined cystic mass with an enhancing rim and lack of Doppler flow, distinguishing a branchial cleft cyst from hemangioma, lymphoma, or other rare branchiogenic carcinoma . Surgical excision is the definitive treatment . Unfortunately, follow-up in this case to determine definitive diagnosis was not possible. However, we are confident that given the location of the mass and its benign ultrasonographic characteristics, in addition to the patient’s previous fine-needle aspiration suggesting such, the most likely diagnosis was a branchial cleft cyst. Importantly, several case reports [8–10] would argue that without this prior knowledge of a benign fine-needle aspiration, it would be unwise to assume, based solely upon ultrasound findings, that this not a cancerous lesion. When working in an austere environment having the ability to distinguish between benign and malignant conditions is important. Ultrasound is the modality of choice in this setting as it is portable and reliable. 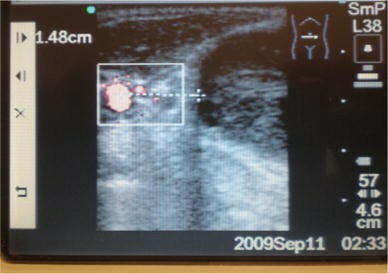 This case demonstrates the ultrasounds ability to identify characteristics of a mass consistent with a benign branchial cleft cyst.